A good brownie recipe means different things to different folks. This recipe isn’t strong on the chocolate, not too sweet and is more on the cake side of the equation. I chose it first for the lower amount of sugar and make it occasionally for that reason. Ya know – healthy brownies. However, every time Bytes will say “this needs frosting!” So much for reducing carbs and calories with less sugar! Last time he even compared it to the brownie in a certain frozen dinner, which he also thinks needs frosting. How would he know about frozen dinners in this household? Oh yeah—those long days of painting over the past year plus. At any rate frosting it is. For his half of the brownies. Not sure how he ends up with half a pan while Wheels and I get to share the remaining half. Something about metabolism I think. 🙂 I will admit the chocolatey-ness and creaminess of the frosting add to the yummy factor, though. 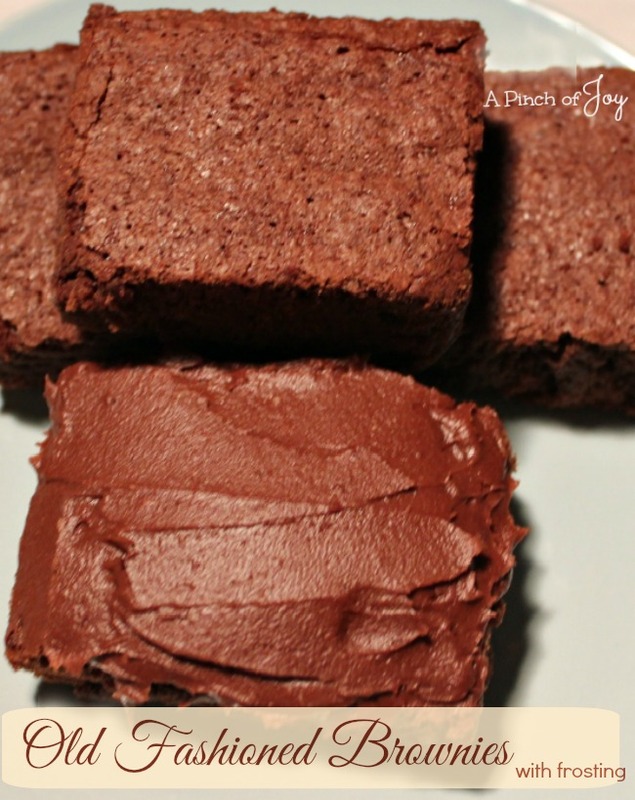 Yes, this recipe calls for baking powder though most brownie recipes do not. Maybe because it is an old recipe. I was a little anxious the first time I whisked the cocoa into the butter, but if you use a good wire whisk it only takes a moment to make it smooth like – well, like melted chocolate. Brownie batter is very thick so you will need to spread it into the greased pan. Let the baked brownie cool before frosting and you will save your sanity and extra cleaning. Any and all brownies may be good right out of the oven, but they are even better if you can contain yourself so the chocolate flavors can develop while cooling. A cake like brownie, easy on the chocolate and sweetness, with a rich chocolate butter frosting! Preheat oven to 350 F. Grease 9x13 inch baking pan with butter or cooking spray. Melt butter in microwave and pour into large mixing bowl. Whisk in cocoa powder until smooth and then stir in vanilla and sugar. Add eggs until just well mixed. Add flour, baking powder and salt; again, until just mixed. Spread into prepared pan and bake at 350 for 25-28 minutes or until a toothpick inserted in the center comes out clean. Test early and do not overbake. Set out butter to soften before you begin making the brownies or soften in microwave for about 10 seconds. Mix cocoa powder and confectioner’s sugar together in medium bowl and cream with softened butter. Add milk and vanilla and stir until thoroughly mixed and fluffy. Spread over cooled brownies and slice into 24 2”x2” bars. Note: Frosting recipe will cut in half easily and turn out as nicely as a full batch.